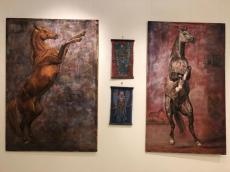 An exhibition "Karabakh horses" opened in Espoo, Finland with the support of the Finnish-Azerbaijani Association (FAA), a member of the European Azerbaijanis Congress. The exposition of the Latvian artist Dace Štrausa is dedicated to the 100th anniversary of the Azerbaijan Democratic Republic, Azertag reported. Its main purpose is to propagate Karabakh and Karabakh horses, one of the national symbols, personification of freedom and nobility. The exposition of the artist living in Finland has been demonstrated in many countries around the world. In May, Latvian artist successfully presented her works in Baku. Finnish citizens, members of Azerbaijani diaspora and representatives of different countries attended the opening ceremony. In her speech, Dace Štrausa stressed that the exhibition showcases Karabakh as an integral part of Azerbaijan. The Secretary General of the Congress of European Azerbaijanis, Vice-President of the Finland-Azerbaijan Association (FAA) Arzu Oktay thanked Dace Štrausa for these paintings and gave detailed information about the Karabakh realities and Karabakh horses. The event featured Azerbaijani music and national costumes. The paintings created by the Latvian artist are endowed with a rich range of feelings and emotions, which in reality can experience these strong and incredibly beautiful animals. For the past two years, Dace Štrausa has been living in Azerbaijan. Shortly after her arrival, thanks to her genuine interest and deep love for horses, she established contacts with many horse owners, paying special attention to the Karabakh horses. Moreover, through her paintings Dace Štrausa seems to return to her first profession. In 1981, she graduated from the Moscow Timiryazev Agricultural Academy, having received a specialty of zootechnics. But after a while, from 1988 to 1991, she received an art education at the preparatory department of the Latvian Academy of Arts. And in 2005 she became a student of courses in a photo school in Riga. As the artist herself admits, she realized that she needed additional education to be able to master all the necessary apparatus of expressiveness, faithfully reproducing the images of her favorite horses on canvas. The refined beauty, strength, special grace of the Karabakh horses delighted artists, writers and poets, who reflected in their works the uniqueness of this horse breed. One of the numerous publications on the Karabakh horses noted that "until the end of the 19th century the Karabakh horses were the beauty and pride of the Caucasus, worthy not only of the princely, but also of the royal saddle." In the Middle Ages this breed belonged only to the Karabakh khans, and the main place for breeding purebred horses was the Khan plant. Chovqan is a traditional horse-riding game played on a flat, grassy field by two competing teams of players mounted on the Karabakh horses. In 2013, UNESCO decided to include the game of "chovqan" on its Intangible Cultural Heritage List. It was an unprecedented case, when the role of the animal in preserving the heritage of mankind was recognized at the international level.